A very large bovine found in Asia's tropical and subtropical habitats. Water buffalo spend much of their time submerged in muddy waters of wetlands and creeks. The species has been domesticated for over 5,000 years, and are used in many Asian countries for plowing, transportation, milk, meat, horns, and hides. 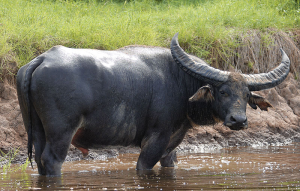 Due to hunting, loss of habitat, and hybridization, the wild water buffalo is now endangered and living in protected areas in India, Nepal, Bhutan, and Thailand. "Wild Water Buffalo at Corroboree Billabong in the Northern Territory of Australia, November 28, 2005" by Djambalawa is licensed under CC BY. N.d. Animals: Water Buffalo. http://animals.nationalgeographic.com/animals/mammals/water-buffalo/, accessed September 29, 2014.